All of your car's wheels are attached to brake rotors that spin with them. When you step on your brake pedal, devices called calipers squeeze the brake rotors to slow them and your wheels to a stop. This creates a lot of friction, and it can do some serious damage to your brakes. This is why you need brake pads placed in between the calipers and the brake rotors. 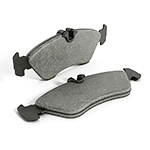 These pads act as buffers between the two components and prevent damage to your brakes. Since the brake pads are themselves under a lot of friction, they get worn down fairly quickly and need to be replaced. You may notice a harsh grinding sound whenever you hit your brakes when your brake pads are wearing down. New brake pads can be purchased at most automotive stores, but they can also be installed by our mechanics. Contact Lion Country Kia for more information about all of our brake services.